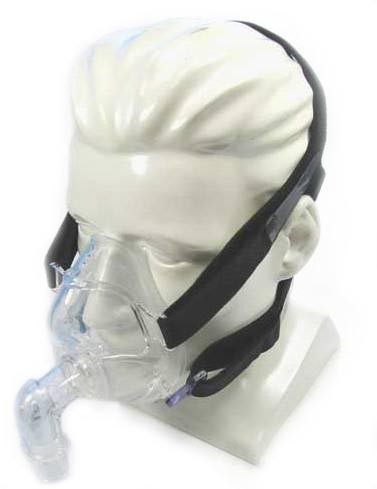 The Full Face CPAP Mask by Drive Medical is lightweight and unobtrusive to the wearer's field of vision. 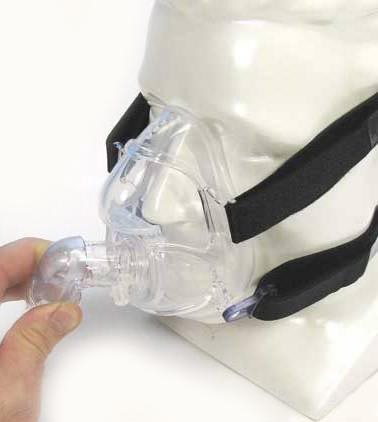 Lightweight Contoured Silicone Design: The Drive Medical CPAP Full Face Mask is made of soft, contoured medical liquie silicone, making it extremely durable, flexible, comfortable and easy to clean. Best of all, it is designed to fit comfortably and provide an excellent seal without the need of a forehead support. 360§ Dual Swivel Elbow Port: Allows for free movement and easy connection to the hose. Ergonomic & Flexible Design: The mask contours naturally to the face and is designed with ribbed support for comfort, fit and seal enhancement. Headgear with Quick Release Clips: Mask can be easily removed without resetting the headgear for convenience. Air Vent Holes & One Way Valve Design: The exhale port is designed to minimize CO2 retention. Love my mask, Great customer service fast shipping. I have used my Drive Medical Full Face Mask for about a week now and am very pleased. Once I got the headstrap adjusted properly all was well. My last mask was a great one to but my supplier didn't have the correct size and it was too expensive through other outlets so I chose to try this mask, and the price was grea too. The quality is far better than some that I have received for a lot more money. I'm very impressed! I recently replaced my ResMed mask with a drive full face and headgear. The head gear is a nightmare to say the list it is difficult to adjust the straps are too long. I will be changing brands very soon. For over 2 years I have complained about the cpap masks that I've been able to get through my supplier. They didn't fit right and they hurt my nose leaving it raw and sometimes bloody. Finally, I pyrchased the Drive model 18204 and have had nothing but praise fro the design and comfort of this product. I love love love this mask. Some users don''t like the quality of the headgear, but I just use the headgear from another mask. The sizing on Probasic''s web site is not to scale. The first time I ordered the medium. It worked but it was too big. This time I ordered the small and it is perfect. I am a small framed lady. I am so excited to have found a mask that is light and small enough. I love the flexibility and there is nothing pressing against my forehead. I HAVE ORDERED THIS MASK VERY PLEASED WITH IT I AM A SIDE SLEEPER DOES NOT INTERFERE WITH SLEEPING VERY COMFORTABLE.I DO NEED ANOTHER HEAD GEAR PART OF FELT IS COMING OFF. BUT OTHER THAN THAT RECOMMEND, HAVE TRYED OTHERS. LIKE THIS ONE THE BEST.